Proponents of the Keystone XL tar sands pipeline often cite energy security and the desirability of Canadian over Saudi or Venezuelan crude in promoting the project. But how does the pipeline enhance American energy security if much of the product it carries is refined and then exported? Research has shown that the pipeline’s major purpose is not to provide oil for the U.S., but to serve as an export pipeline fueling international markets. New data reveals that a full 60 percent of gasoline produced in 2012 at Texas Gulf Coast refineries was exported. These are the refineries that would process the majority of the tar sands bitumen flowing through the Keystone XL pipeline, if it were built. The changing dynamics of the U.S. oil market strongly suggest that exports would only rise over the lifetime of the pipeline. U.S. production is rising but consumption is declining and the industry will continue to maximize its profits through exports. Using government data for exports from Texas Gulf Coast ports and for Texas Gulf Coast refinery production, the data shows that these refineries are now exporting 60 percent of their annual production of ‘Finished Motor Gasoline’. In addition, 42 percent of the diesel produced by these refineries is currently exported, which is an 11 percent increase over 2011 diesel exports from these refineries. Finally, over 95 percent of their production of petcoke – a dirty coal substitute that is a byproduct of refining heavy oil – is exported. In other words, the State Department’s own analysis acknowledges that the majority of refined products produced on the Gulf Coast are already being exported. Those who believe that Keystone XL is necessary for U.S. energy supply might be surprised by this fact. 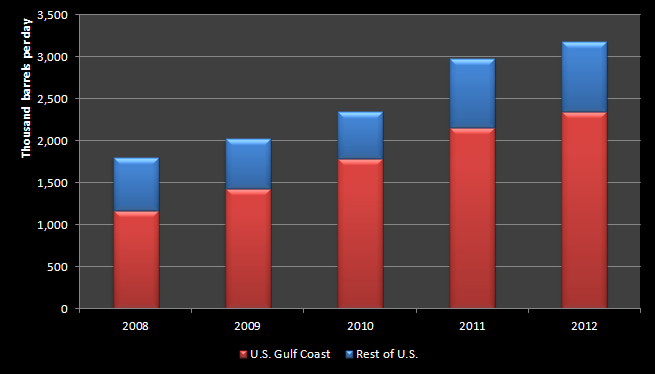 Gulf Coast refineries have been at the center of the petroleum products export boom for years. The wider PADD 3 refining region, which includes Louisiana, Mississippi, Arkansas, Alabama and New Mexico as well as Texas, exported over 2.3 million barrels per day (bpd) in 2012 out of a U.S. total of nearly 3.2 million bpd. (See chart). Since 2009 PADD 3, which has just over 50 percent of U.S. refining capacity, has been the source of over 70 percent of U.S. exports, reaching 74 percent in 2012. 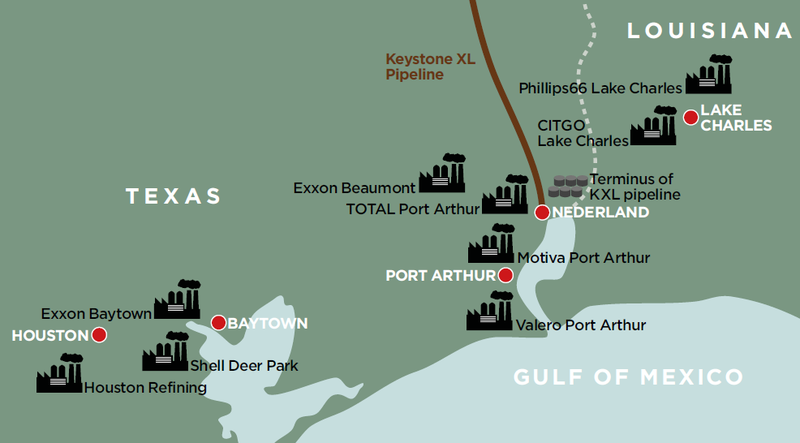 Refineries in Port Arthur, Houston, as well as in Lake Charles just over the border in Louisiana, will all have excellent access to both the Keystone XL pipeline and export facilities, and are already at the core of the PADD 3 export boom. Map: Refineries that will have direct access to Keystone XL have excellent access to export facilities. Valero has a large refinery in the area and ambitious export plans. It claims in recent investor presentations to be responsible for exporting up to 25 percent of U.S. exports “over the past few years”. That means it exported about 800,000 bpd in 2012, or nearly 40 percent of its U.S. production. The Motiva Port Arthur Refinery – a 50/50 joint venture between Royal Dutch Shell and Saudi Aramco – has just completed the biggest refinery expansion in U.S. history. The $10 billion, 5-year project added 325,000 bpd of refining capacity to create the country’s largest refinery at 600,000 bpd. Much of this capacity is configured to process heavy oil. At the plant’s official opening in May 2012, Shell’s CEO Peter Voser told journalists that “clearly exports are part of (the) thinking”. An analyst at Bank of America-Merrill Lynch recently told the Investor Daily that, “The bulk of the Motiva plant’s production is — like a growing share of refinery capacity along the Gulf Coast — geared for export (…) (w)e can export gasoline and diesel to northwest Europe cheaper than they can produce it locally”. The Investor Daily report concluded that because of exports, the massive production expansion at Motiva Port Arthur would not result in lower gasoline prices for American consumers. 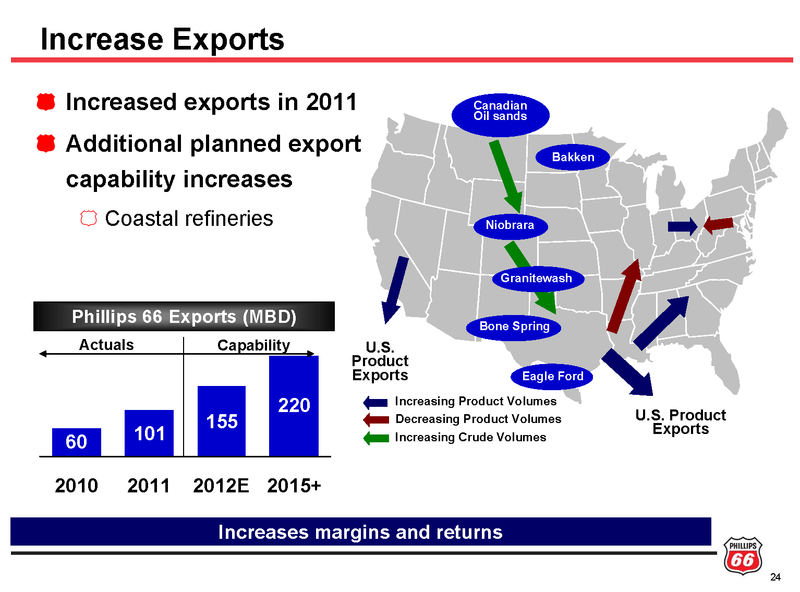 Phillips66, the newly formed independent refining company that split from ConocoPhillips, is aiming to almost quadruple its exports from 60,000 bpd in 2010 to 220,000 bpd in 2015 (see presentation slide below). It has a 240,000 bpd refinery in Lake Charles, LA, with access to KXL and boasts on its website of this refinery’s ability to export through its marine terminal. In 2007, when the Keystone XL pipeline was first proposed, it was not yet as clear as it is today that U.S. oil demand is in decline. Once in office however, President Obama moved aggressively on much needed vehicle efficiency standards that have clearly put the U.S. on course to reduce oil consumption. U.S. oil demand is now seen as having peaked in 2005, and if additional climate-friendly policies are put in place it is expected to decline further. Additionally, few realized then that new technology (hydraulic fracturing, or fracking) would precipitate a rise in U.S. tight oil (and gas) production. In other words, the U.S. oil market that Keystone XL was conceived in is a very different market to that which exists today. Many refineries in Texas invested in the original Keystone XL concept; a concept that saw U.S. oil demand continuing to grow while U.S. oil production continued to decline. They invested billions in equipment to refine Canada’s heavy sour tar sands oil because they thought the tar sands would provide a reliable source of oil for years to come via the Keystone XL pipeline. These investments were supported by generous tax breaks. In the intervening years the world changed. These refineries found themselves in the middle of big investment cycles in a declining market. Pretty soon they realized that their future was not in selling gasoline to the U.S. market but in selling diesel, gasoline, petcoke and other products to Europe, Latin America and Asia. They also underestimated the rise in public opposition to the tar sands and the increasing urgency with which the American public would demand action on climate change. It is now clear that the Keystone XL pipeline is a pipeline through America not to America. Tar sands producers are desperate to get their product to refineries that serve international markets so that they can expand their market beyond U.S. borders, increase the price they get for their product, and maximize profits. The refiners that will help them do that are increasingly dependent on serving export markets to maximize their profits amidst a domestic market that is both striving to become more efficient while at the same time is already flooded with oil. That this has nothing to do with the U.S. national interest, the main criterion for State Department approval, is now even more abundantly clear. U.S. Census Bureau data obtained via special request. Based on a 90% utilization rate of Valero’s 2.3 million bpd U.S. refinery capacity. continue buying it instead of transporting dirty tar sands which is an inferior product and costly to produce especially the use of so much water. With most of it going overseas, why risk our environment to transport it across the bread basket of our country? The Keystone XL Pipeline would not serve that US national interest as it’s purpose is to use US refineries and export the product. Permission to build should be denied. Keystone XL already is exporting 60 % of the oil that it refines and US demand for oil has declined since 2007 while US production has risen. Lorne Stockman points out the “Proponents of the Keystone XL tar sands pipeline often cite energy security and the desirability of Canadian over Saudi or Venezuelan crude in promoting the project. But how does the pipeline enhance American energy security if much of the product it carries is refined and then exported? refineries that would process the majority of the tar sands bitumen flowing through the Keystone XL pipeline, if it were built. The changing dynamics of the U.S. oil market strongly suggest that exports would only rise over the lifetime of the pipeline. U.S. production is rising but consumption is declining and the [oil] industry will continue to maximize its profits through exports. there are no economic prerogatives to justify such an expensive, disruptive undertaking — only down-sides exist for the pipeline, unless you’re a multi-national corporate entity. our future depends upon immediate withdrawal from fossil fuel drug addiction. solar and wind are the path to energy independence. Do not put oil before people and environment. you are effectively destroying this planet. It’s my opinion the raw products passing through the pipeline should be refined and stay in America. We’re not permitting this to make buckets of money for Canada, but to save AMERICA from being held HOSTAGE over OIL.